Being located within a popular residential location, which has primary and secondary schools nearby, is this bay fronted and extended 3 bedroom and 2 reception room semi detached property. This gas centrally heated (from combi boiler) and uPVC double glazed property comprises, on the ground floor, of an entrance hall, bay fronted living room, further reception room and an extended kitchen/dining room to the rear. On the first floor are 3 bedrooms and a bathroom with a modern fitted white suite. 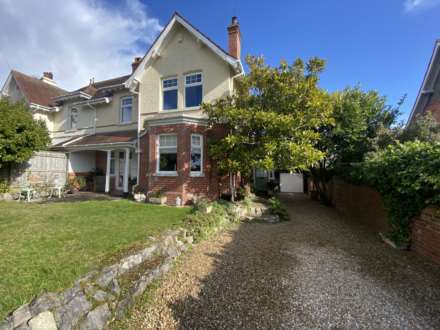 The property further benefits from a block paved garden to the front currently used for off road parking and an enclosed, easy to maintain and south facing paved rear garden. Walk in square bay window to front. Focal point of a living flame, coal effect gas fire with a tiled back, stone hearth with a brick surround and wooden mantel above. TV point. Radiator. Window to rear and door leading out to the paved rear garden. A fine addition to the property. Good range of floor and wall mounted cupboard and drawer storage units with roll edged work surfaces and tiled splash backs. Inset stainless steel one and a half bowl sink with a single drainer unit and a mixer tap above. Built in 4 ring gas hob with a filter hood above and an electric oven below. Integrated fridge and freezer. Space and plumbing for a washing machine and a dishwasher. Radiator. Tiled flooring. Ample space for a dining table and chairs. Concealed, wall mounted gas fired combi boiler supplying the gas central heating and domestic hot water. 2 x Glass fronted display cupboards. Window to rear. Radiator. Storage recess. TV point. Access to insulated loft space via trapdoor with ladder. Window to front. Radiator. TV point. Obscure glazed window to rear. Fully tiled walls. Modern fitted white suite comprising of a panelled bath with a thermostatically controlled shower unit above and shower curtain and rail. Low level WC. Pedestal wash hand basin. Radiator. Vinyl flooring. To the front of the property is an open plan area which is laid to block paving, which is currently utilised by the owners for off road parking for a motor vehicle. To the rear of the property is an enclosed, easy to maintain and south facing garden that is laid to paving and provides an excellent area for outdoor dining and sitting during finer weather. Timber fenced boundaries. Outside lighting. Front pedestrian access via a timber gate to the side of the property. All mains and services are connected. Council Tax Band C.
From our prominent town centre office, turn right up Rolle Street and continue into Rolle Road until the roundabout. Turn left along Salterton Road and at Littleham Cross traffic lights, turn left down Bradham Lane. Turn right into Holland Road and 2nd right into Masey Road. The property will be found on the right hand side, clearly identified by our for sale board.